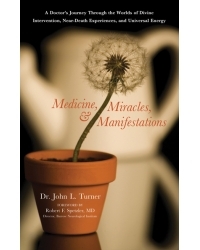 Dr. John L. Turner and his journey into the field of Integral Medicine. During his career as a board-certified surgeon, Dr. Turner’s curiosity drove him to explore nontraditional healing techniques that broadened the scope of recovery for his patients, including energy healing, chanting and meditation (approaches historically found in religious practices), soul travel, and astral projection. • How metaphysical events such as remote viewing, telepathy, consciousness, and life after death are all verifiable manifestations of the way the human brain interfaces with the universal consciousness. • That consciousness persists after the death of the physical body. • That our life is carefully planned before birth but there is an element of free will. • That we can interface with a spiritual world and a collective human unconscious. John L. Turner, MD, served as the first neurosurgeon on the Big Island of Hawaii. He arrived with the desire to investigate the spiritual world and understand the meaning of life, death, and life-after-death. His metaphysical experiences began the first night he was on call and continue up to the present. Dr. Turner balances his time between stargazing from an observatory dome at his rain forest home and serving as a consulting physician for the Hilo Pain Center in Hilo, Hawaii.